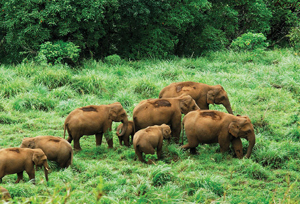 Periyar Wildlife Sanctuary, locating in Thekkady is the perfect example of nature's bounty with great scenic beauty and rich biodiversity. In this astounding location of Kerala, the Periyar National Park and Wildlife Sanctuary is considered as the most protected area for the elephants and the tigers. One of the most renowned national parks in South India, the Periyar National Park is set high at the Western Ghat ranges. The protected area is widespread along the area of 925 sq km (357 sq mi). The rest of 350 sq km (140 sq mi) of the core zone was declared as the Periyar National Park in the year 1982. The park is being adorned with a picturesque lake at the heart of the sanctuary which is an artificial 100 years old lake at Thekkady and is basically known for its wild elephants and thickly established Western Ghats forests. Many of the intense valleys of Periyar contain tropical evergreen forest with extremely thick tree cover with hardly any sun-rays to get penetrated. These trees are fully grown at the amazing heights of up to 130-140 feet. Some of the areas in the park contain marshy grasslands near the edges of the lake and other water bodies. Spread out across the park are also patches of semi-evergreen forest used as important cover by many of the animal species. Earlier was under the reign of the Pandayas in 12th century a dam named Mullaperiyar was constructed across the west flowing river Periyar. As a result, it created an artificial lake in the area which today stands at the centre of the sanctuary, enhancing its beauty to greater extents. With the creation of this lake, the landscape and the features of the valley changed drastically. During the 18th and 19th centuries, the reserve was the hunting ground of the Travancore kings, which is today the part of most of the Southern Kerala. In 1899, the area was declared as a forest reserve called the Periyar Lake Reserve with an intention of protecting the hunting areas of the kings from the encroachment of tea plantations. Further, in 1934, the lake reserve was converted into a game sanctuary, the Nellikkampatty Game Sanctuary. The Game Sanctuary covered an area of about 500 sq km. In 1950, some more area was added to create the Periyar Wildlife Sanctuary. 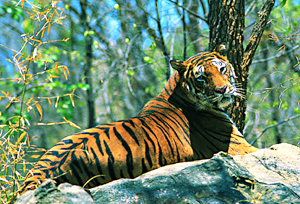 In 1978, the sanctuary was included in the Central Government initiative to be known as the Project Tiger and was renamed as Periyar Tiger Reserve. In 1992, the reserve also became a part of Project Elephant when it was launched by the Central Ministry of Environment and Forests to protect the free ranging populations of wild Asian elephants in various states of India. Apart from Elephants, the other animals can be found in the Periyar Sanctuary are, Wild Pigs, Sambar, Gaur, Mouse Deer, Dole or Barking Deer, Indian Wild Dog and Tiger. There are, now estimated counts of 40 tigers in the Periyar National Park. The major four species of primates are also found at Periyar - the rare lion-tailed macaque, the Nilgiri Langur, Gee's Golden Langur, Common Langur and Bonnet Macaque. Periyar is also being considered as the habitat of the elusive Nilgiri Tahr, which can rarely be seen but commends its presence. The Periyar Tiger Reserve consists of tropical evergreen, semi- evergreen and moist deciduous forests. Its legal status as a National Park is still pending and only one notification has been issued. It was declared as Project Tiger Reserve in 1978 and the first research for its status was tracked in 1991. The research followed 49 species of mammals, 246 species of birds, 28 species of reptiles, 8 species of amphibians, 22 species of fishes and 112 species of butterflies. The terrain of Periyar ripples with lofty peaks of over 1700 meters bordering the north and east. Towards the west, it merges into an extensive table-land of Mount Plateau with an average elevation of 1200 meters. From the edge of this plateau, the land falls steeply to the thickly forested tracts of Sabarimala hills in the Pamba River basin. The wildlife lovers and the tourists can enjoy excursion at the zone of the sanctuary and can visit Cradomom Hills and Pandalom Hills that bring the most splendid Kerala's natural beauty along with visiting the town of Kumily which is a growing town to fetch the spice trades in Kerala, which is the major occupation of its residents. Besides, these two fascinations the tourists can also enjoy boat cruising at the famous Periyar Lake. 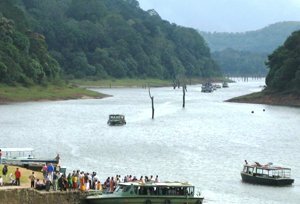 With boat cruising, the tourists can get to visit the wilds of Periyar Wild Sanctuary by the water's edge. Periyar Lake - the Periyar Lake is situated at the sanctuary area and the reserve is named after this lake only. The tourists can enjoy the full scenario of the sanctuary by boating around this lake. Kumily - A small town near Thekkady and Periyar which is best known for cardamom hills located in the district of Idukki in Kerala. Due to the abundance of presence of holy temples this place attracts both the nature lovers as well as the spiritual people. Pullumedu - Located at the distance of 43 kms from Thekkady, Pullumedu is the area famous for wildlife sanctuaries and greeneries. Besides, tourists can also get to visit Shri Ayappa Temple and the Makara Jyothi temple at this region. Boat cruises calls the best option to check out the wilds of Periyar Sanctuary. Today the Periyar Lake is adorned with an excellent boating spot for the tourists. Although it is unusual to see many animals from the boats, still you spot a family of Elephants, Wild Boar, and Sambar Deer by the water's edge along with some water-bodies. The upper deck is best for wildlife viewing when taking a boat cruise, but better turn up half an hour early to get the best seat. To maximize the chances of sighting, the tourists can also take the 7.00 am boat. Besides, they can also book for their own boat (on renting). Every day for Half an Hour: 06.00 A.M. to 05.00 P.M. 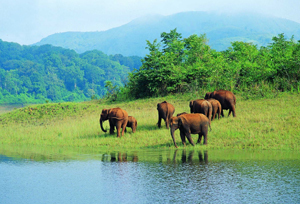 The best season to visit Periyar wildlife sanctuary is from the months of October to June. By Air : Kochi (Cochin) at 200-kms or Madurai in Tamil Nadu at 140-kms is the nearest airports from Periyar. By Rail : Kottayam at 114-kms is the nearest railhead from Periyar. By Road : Kumily, the nearest town from Periyar is well served by both state and private buses from Kottayam, Ernakulam and Madurai in Tamil Nadu. While roaming around the most placid land of "God's Own Country" in Thekaddy, the Periyar Sanctuary is actually decked with tremendous natural bounties to be more fancied with the presence of the magnanimous elephant's counts in the arena. And to realize that natural beauty, a relaxing stay at its vehement hotels and resorts will do wonders to your stay. Along the impressive natural ambience, the luxury avails at this resorts and hotels will make up your mind for more stretchable journey in Periyar where some of the boat houses or houseboats are also marking great sophisticated look to make the boat safari more sovereign and impressive.